So, I've kicked my bloggers block, got my act together and I'm back. Despite being quiet online for too many months for my liking, my thirst for anything related to beauty, remained unquenched. As a result, I have an absolute tonne of products stocked up that I need to both rave, and unfortunately, rant about. First up, there's the products I'm currently obsessed with. 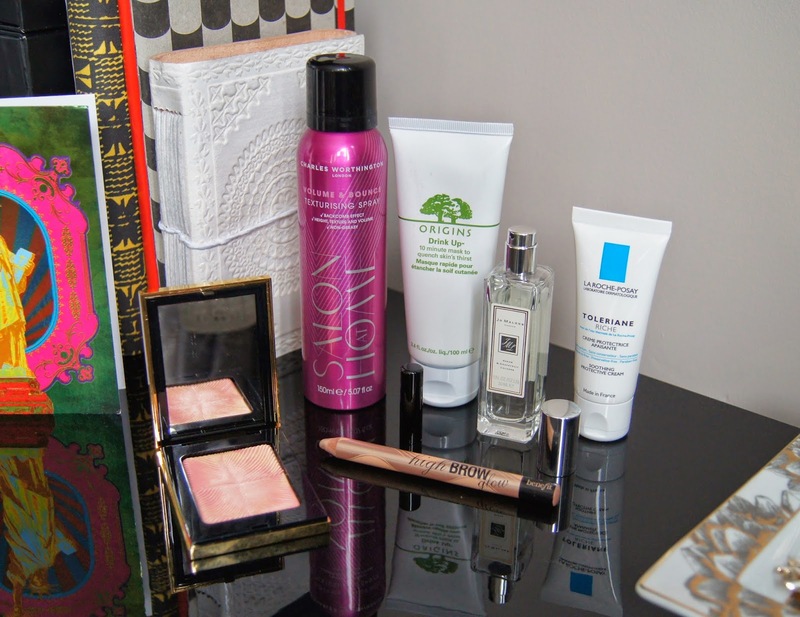 Spring is finally here and this is one of my favourite seasons for beauty! Part of the YSL Beauty Spring 2014 collection is one of the most beautiful blushes I've ever seen - the YSL Flower Crush Palette Rosy Blush! 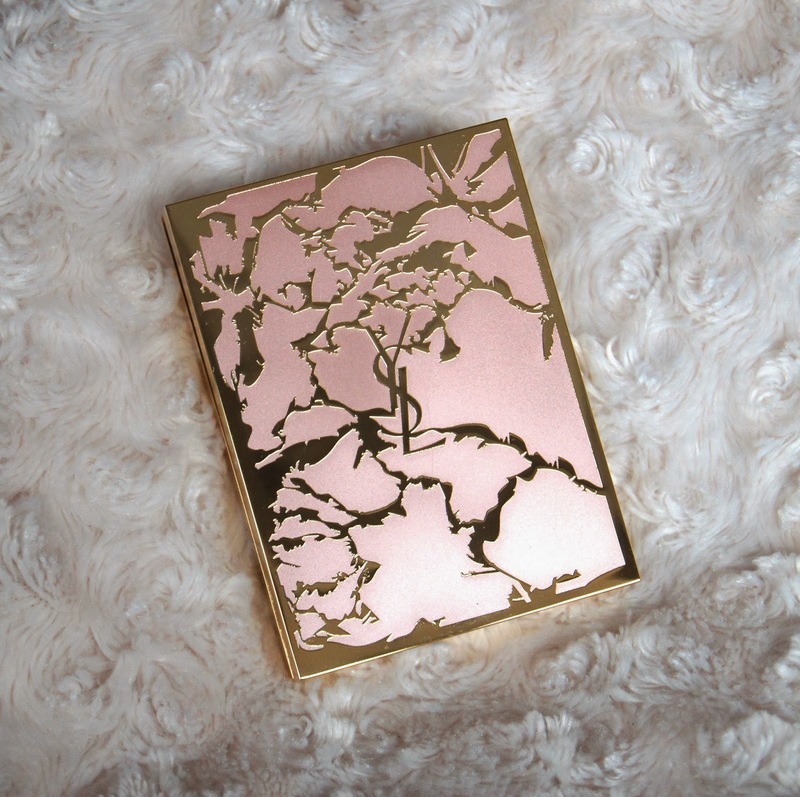 Being a total sucker for anything with detailed embossing, I was immediately drawn in as soon as I clapped eyes on this insanely gorgeous compact at the YSL counter and couldn't leave it behind. Not only is the intricate design divine, but so too, is the formula. I'm ashamed to admit that I did have to take a deep breath before swirling my brush over the powder, ruining the pattern, but hey, you can't just keep these products locked away forever, untouched! Formula wise, the silky-soft powder is smooth and blends easily. 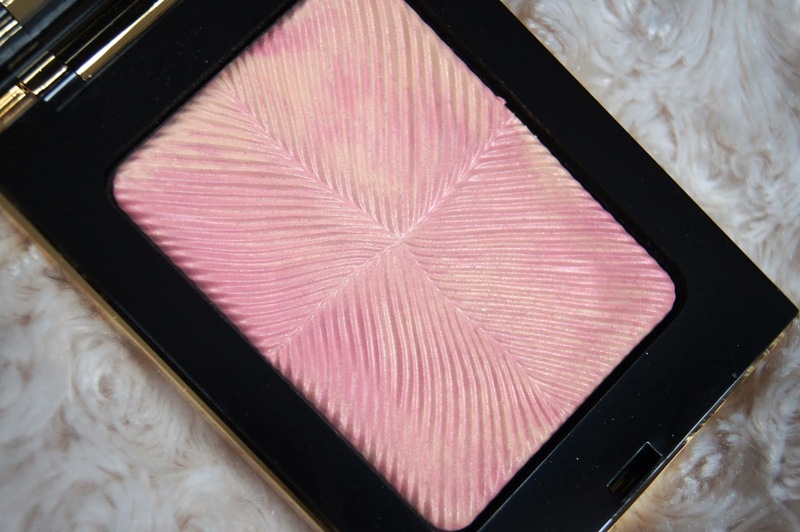 More of a blush and highlighter hybrid, this leaves the cheeks with such a healthy glow and a gentle hint of pink. Ideal for Spring, the pink shade is quite subtle, giving a soft, candy-floss colour that won't detract away from the makeup trends of the season - a flawless, dewy complexion, pastel eyes or a bold, orange-toned lip. Instantly, the complexion is brightened and when the light catches the cheeks, the sheen is just beautiful. Infused with silver flecks, it's rather shimmery and there are some larger chunks of glitter in there, but they aren't too obvious, unless you're an inch away from someone. There's no need to worry about being heavy handed with this blush; if anything, it needs to be layered up so that the sheer colour lasts throughout the day. YSL certainly haven't cut any corners with the look of this packaging. But, for the whopping price-tag, I was expecting the high-end compact to feel more luxurious and weighted. That aside, there's a decently sized mirror in the lid, which makes it great to take out with you. If I ever actually hit pan on this and use it all up, I'll definitely clean it up and keep it in my makeup bag! Now that the sunshine is starting to make a regular appearance and Summer definitely feels like it's on its way, I have begun to raid my stash for highlighting, radiance fakers to keep me going until the sun gives me back a natural, healthy glow again. Keeping my complexion base sheer and dewy during Spring, I like to continue the trend with the eyes and cheeks, by using cream products, rather than powders. 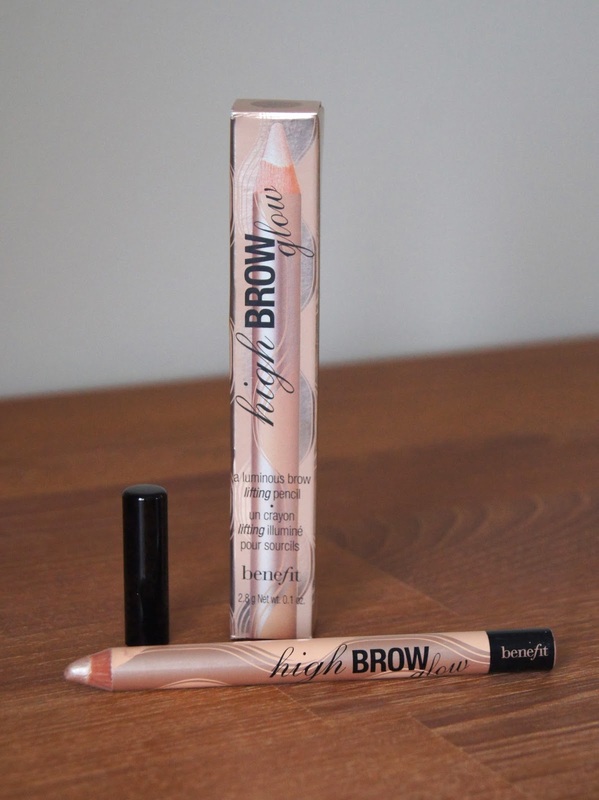 The Benefit High Brow Glow pencil illuminating pencil isn't strictly reserved for my brow bone, but gets blended into the inner corners of the eyes, onto the cupid's bow and dotted onto the tops of my cheekbones occasionally, too. 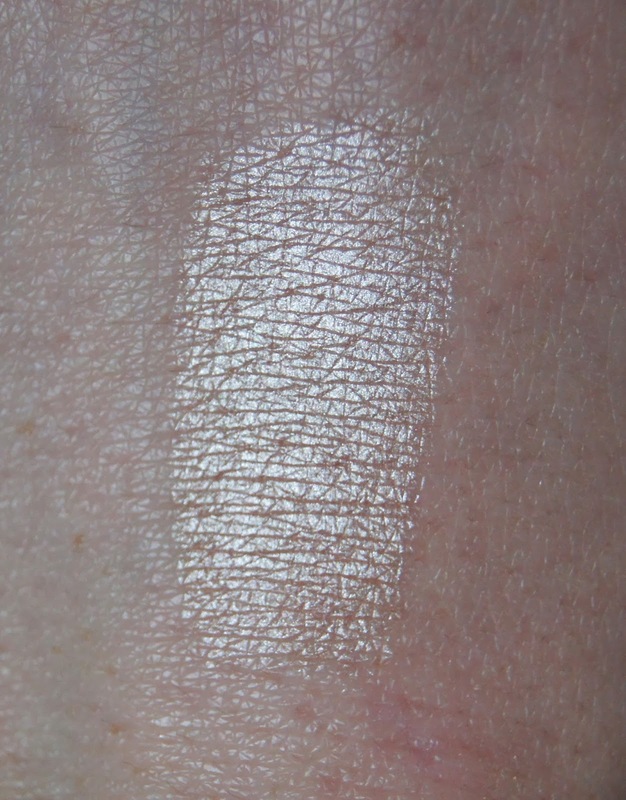 Soft and light, the champagne-coloured cream glides onto the skin and blends like a dream. It doesn't ever look cakey or dry, resulting in a believable, natural looking finish. Hassle-free, all it takes is a quick swipe of the stick and the dab of a finger to blend it out. Easy. Personally, I find fingers to be the best tool to blend this product, with their warmth helping to melt it into the skin. Rather than being full of chunky glitter or shimmer, this pencil has a gilded, pearlescent finish. Day to day, a light layer adds a touch of brightness to the face, preventing skin from looking dull and tired. For evening, the intensity can be ramped up by building up the pencil, giving a more dramatic, frosty finish. Of course, Benefit wouldn't forgo their usual, kitsch packaging and the design has a retro feel to it. The pencil format is perfect for precision application in harder-to-reach spots, such as in the inner corners of the eyes, which a brush can't always get to. Unlike cream highlighters that are in a compact or pot, this slim pencil easily slots into your makeup and takes up barely any room, without the need for carrying an extra brush, either. My skin has definitely done a complete 360º over the past year. Gone are the days when my skin would get super shiny and I could only reach for oil-free options, fearing breakouts from heavy, thick formulas. It's always been dehydrated, but now my face gets dry and irritated if I don't cater to its new needs. Lately, my skincare battles have involved regular exfoliation and as much hydration as possible, to leave everything smooth and glowing. When it came to face masks, hoarding clarifying, clay versions was my plan of attack. I've always had a variety of treatments to tackle whatever skincare woes I may be struggling through, but now there's a significant increase of hydrating heros in my drawers. 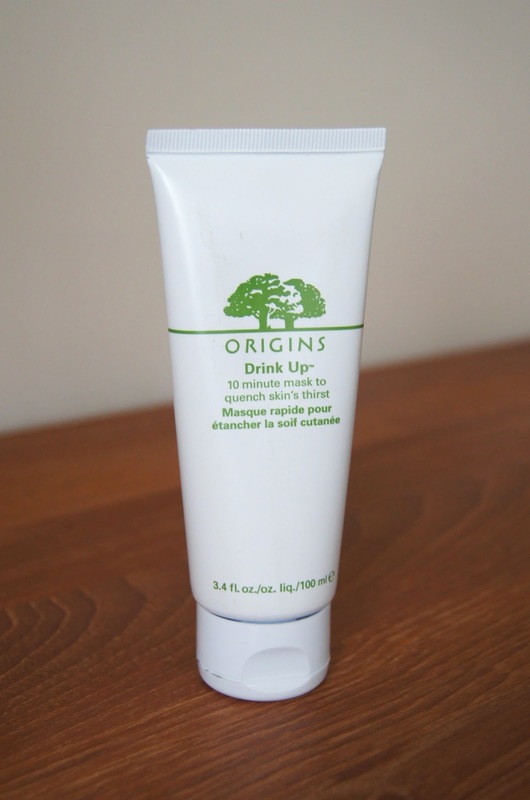 Recently, my favourite has been the Origins Drink Up 10 Minute Mask. Everyone seems to rave about the Origins intensive, overnight formula, but I haven't tried it, as the thought of keeping a mask on for that long somehow puts me off. I prefer a quick burst of moisture, before following up with the rest of my trusty routine. First off, this smells of apricots: a little sour to make my mouth water, but so fruity, sweet and just delicious. Light and soothing, the formula perks skin up, leaving it brighter, plumper and much softer. 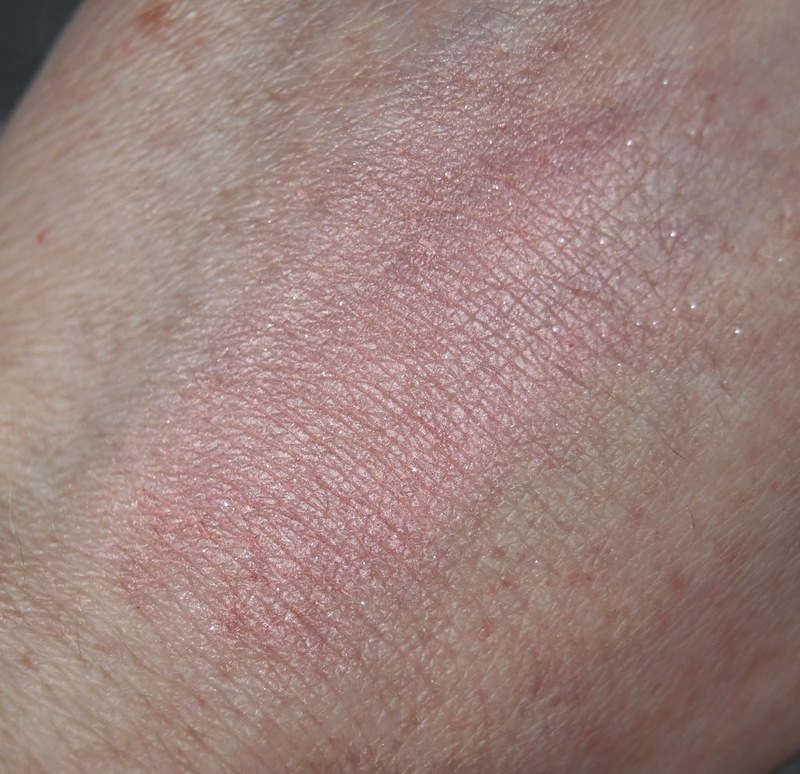 Any unsightly, flakey bits are kept at bay and skin is left calm, rather than red and angry. When rinsed, there's no greasiness left behind and my pores don't feel at all clogged up. Rather than being an emergency, immediate result product, I'd say this is a mask which prevents skin from getting dry with regular, continued use. It doesn't give you a miracle cure, but it's a great mask to use to stop skin from becoming dehydrated and sore. I've been impressed with all of the Origins masks, but this has been the stand out for me during the colder months. Since October, I've been using this mask about twice a week and it's far from empty. The packaging may not be anything special, but I'd much prefer that the product works, rather than just looks pretty. As previously mentioned with the Origins mask, slathering as much moisture onto my skin as possible is a must at the moment, to keep my skin from getting stressed. I hadn't changed anything about my skincare routine, but irritation struck towards the end of last year and I immediately paired down my routine, keeping it simple. Known for being gentle on sensitive skin, I added the La Roche-Posay Toleriane Riche Cream into my emergency, SOS stash. Free from preservatives, fragrance, alcohol, parabens, lanolin and colourants, this formula is free from almost anything that could aggravite skin whatsoever. Instead, it soothes irritated, sensitive skin, relieving any itchiness and tight feeling. After only a week of use, I noticed that my face had barely any redness to it, after previously resembling a tomato thanks to my sudden and unwelcome skin drought. It does all of that hard work and still doesn't clog pores, being non-comodegenic. Genius. Yes, it does tend to sit on the skin for a while before it fully soaks in, but I love that. Anything that gives my makeup more of a dewy finish is welcome now and this moisturiser acts as a great, hydrating primer for me. Heavier foundations are given a boost of moisture when buffed over this cream, making them much more natural-looking and flattering in Spring/Summer. Using this in the morning, along with the Toleriane Ultra moisturiser overnight, my skin is well on the way to becoming 'normal' again. Of course, when it comes to skincare, everyone is different and what works for one person, may not work for you. 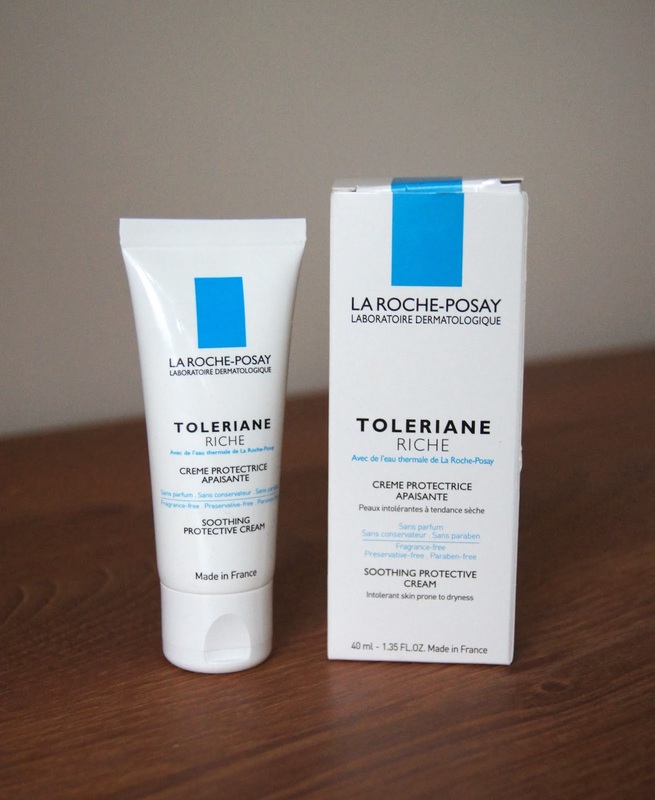 But, if you're struggling to find a moisturiser that is effective enough, without breaking the bank or making any irritation worse, I definitely think that the La Roche-Posay Toleriane range is one to try. There's no frills with this clinical brand, but it doesn't try to be at all fancy. La Roche-Posay focuses on the main thing - doing the job. Fine by me. Available at the drugstore, the cost is low and as it's so emollient, a 30ml tube lasts me for well over a month. With my hair being so long and quite fine, I'm always after hair products that claim to add volume and give hair a boost. Either by leaving my barnet feeling sticky and knotted, or by making virtually no difference to my hair whatsoever, I've tried too many products that have often left me with disappointing results and an overflowing drawer of abandoned styling products. A drugstore dupe for the highly-praised Oribe Dry Texturising Spray, the Charles Worthington version is a fraction of the price. 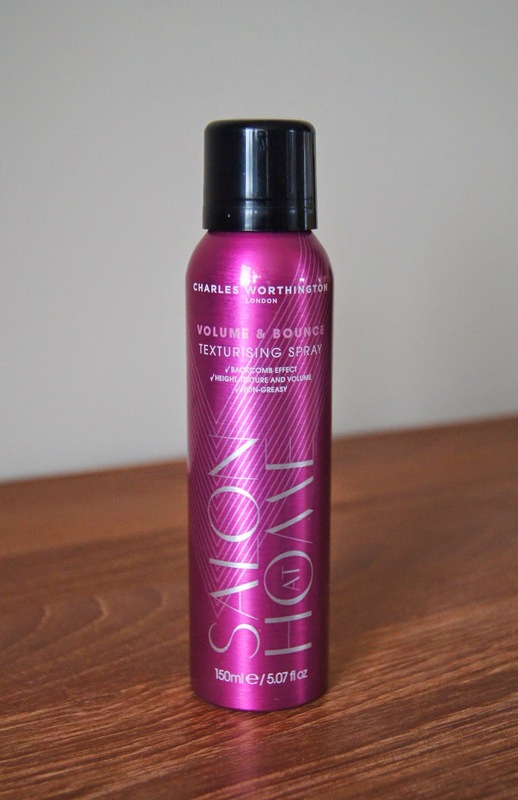 After watching a Youtube video from the beautiful Fleur DeForce, I heeded the advice of her and Amelia and thought I'd try the Charles Worthington Texturising Spray. Whilst this works in the same way as many texturing products, this dry spray doesn't seem to deposit as much product in my hair. There's no gross, wet, sticky gunk left in my roots, as it acts more like a light hairspray. Hair isn't at all weighed down, which is a con of many other, similar products on the market. Spritzed into the lengths and ends also, my hair looks and feels much fuller, but without any crispiness. When first applied, you get mega hair that is just something else. Throughout the day/night, it does drop a little, due to weather and the fact that my hair is so flipping' long, but a rub with my fingers brings the bounce and volume back instantly. When brushing, this styling spray doesn't cause me to shed any precious strands whilst I battle a tonne of clogged up knots. No, my Michael Mercier brush glides through my hair with ease, allowing me to rough everything up to get as much volume as I desire, whilst being able to smooth the top layer down a bit. 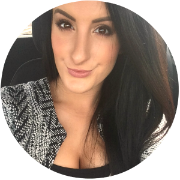 If I don't wash my hair the next day, the voluminous affects are still achieved, but I wouldn't leave my hair for longer without washing it, as my fine hair tends to feel a bit bogged down and heavy after two days. 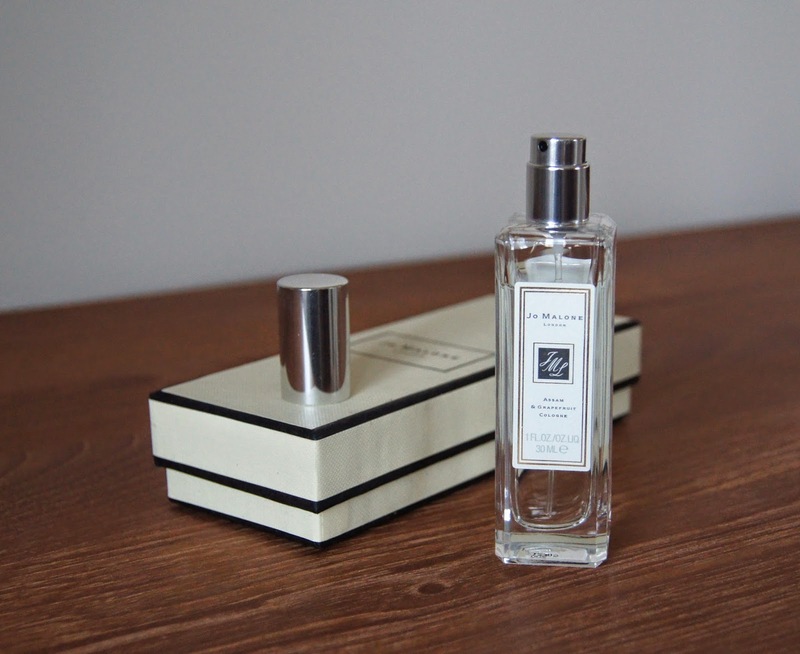 After perusing the Jo Malone shelves on the hunt for a Mother's Day gift a few weeks ago, I came across the Jo Malone Assam & Grapefruit Cologne, which I hadn't noticed before. I'm not entirely sure how available this particular fragrance is, whether the previously limited-edition has been recently re-released, or whether it's a Selfridge's exclusive. Whatever the case, I'm extremely tempted to go and purchase a couple more bottles. Deciding on the English Pear & Freesia fragrance for my Mama, I decided to pick this up for myself, ready for the Spring/Summer seasons. Initially, this scent has a fruity, zingy burst, courtesy of the citrus, Grapefruit top notes, but it has a warm, rich undertone to it. Once it has dried down, the Almond element becomes more apparent and the scent becomes sweeter. The Assam (Black Tea) and Cardamom gives the fragrance a spicy edge, with Musk adding to the depth also. Without being overpowering, you get a fresh scent that has a warmth to it, which is ideal during the sunnier months. What products were you loving last month?